UPDATE 09/05/2018: Construction has been delayed on the sewer capacity improvement project due to high levels of ground water. Work will continue as soon as possible. The City of Harrington is working on improving the sewer system. The following provides information on the project. Sewer mains are being upgraded to allow for more capacity. See the diagram below for the project area. Construction will start on Gordon Street and work towards Clark Street. The work will begin on August 1, 2018 and is scheduled to be completed by November 21, 2018. Work hours will be 7 am to 5 pm Monday through Thursday and Friday as needed. DelDOT requires that if a lane must be closed on state maintained roads, work must be performed continuously until the lane is reopened. This means that work will be performed throughout the whole night on Clark and Liberty Streets as needed. As the project continues and the area that is part of active construction moves, the contractor (A-Del Construction) will leave notices on doors of homes that will be in the work area 48 hours prior to work being done. 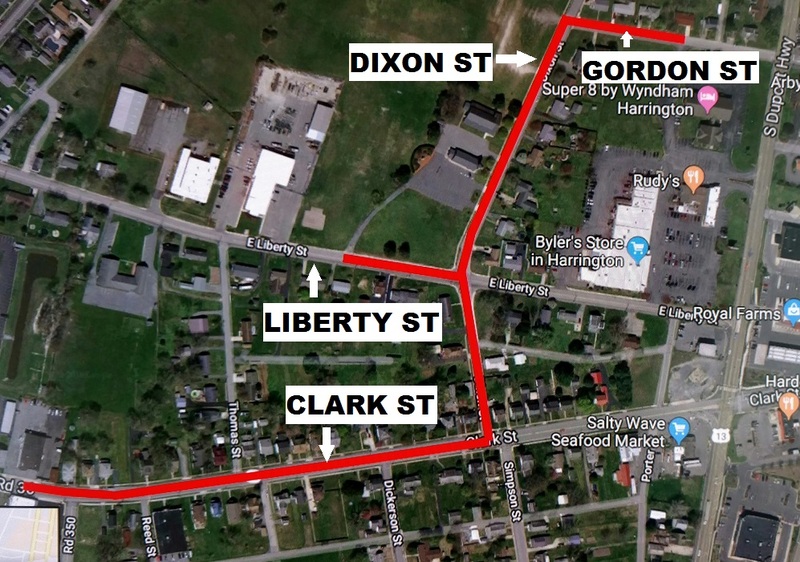 Roadways will be opened to allow for the replacement of sewer pipes. Please be aware of construction vehicles and workers. Sewer service to properties will be briefly interrupted as each service line is moved from the old sewer main to the new one. Please contact City Hall if you have any questions, 302-398-3530.